Have you registered for UVic Alerts? UVic Alerts is a system that allows the university to quickly and efficiently contact students and employees with important information during a disruptive event. The system allows UVic to send messages to members of the university community by multiple methods including email, telephone and mobile text messaging. During tests the voicemail message to office and classroom VoIP phone will be broadcast for up to 15 minutes. You can stop the broadcast by lifting the handset. UVic's Alerts is part of UVic's overall approach to emergency management, and complements other methods of campus communication. UVic's first priority is the safety and well-being of our students and employees. The UVic Alerts System is tested twice a year. Thank you for your patience and cooperation – testing is essential to ensure UVic can provide an effective notification system. 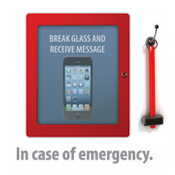 The UVic Alerts system has been designed to send messaging via multiple methods (text, email, digital displays, website, Twitter, and VoIP desk phones). It is important to note that the alerting system, or any of its components, can experience service interruptions beyond our control. This type of service disruption, while rare, could render portions or all of the alerting system unable to send timely messaging via all identified communications channels. Visit www.uvic.ca/personal-profile. If you are not already signed in to UVic My page, you will need to log in with your NetLink ID and password. Add a mobile phone number to your personal profile if you wish to receive text messages on your mobile phone. Without current contact information, UVic will not be able to reach you with important information and instructions during disrupting events. The system will be used only to send messages during disrupting events. For more information, please contact the Manager of Emergency Planning, at 250-721-6355.